Despite space travel being a reality for decades, it has truly comes to people’s attention nowadays. With the Curiosity rover landing on Mars, people’s interest in space, science, astronauts, and flight directors with mohawks has piqued. While the robot on Mars has been making headlines with its fascinating image captures, there are numerous remarkable photographs taken on our home planet of other space travel-related subjects over the past few decades. Photographer Dan Winters knows this all-too-well as a photojournalist who has chronicled several of America’s space aeronautic launches, right up to its conclusion. America’s Space Shuttle program spanned 30 years and landed its final shuttle last year on July 21, 2011 at the Kennedy Space Center. Winters was there for that final landing as well as other historic launches. What separates his photographic documentation from others is the clarity with which his images capture the scene and how close he is able to get to the launch site. 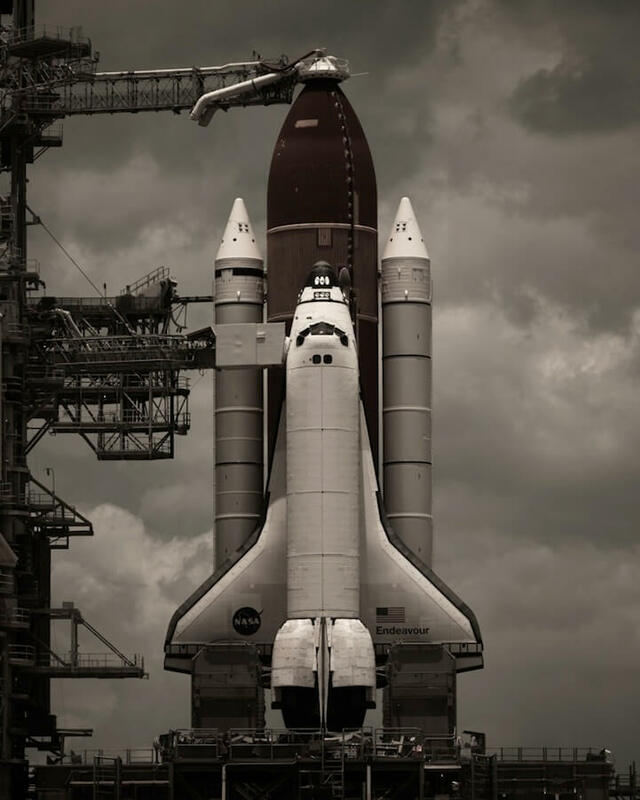 Most photographs show the shuttles and their firing jets from a distance, often enveloped in their own smoky emissions. Winters, however, manages to get some tight shots that makes the viewer feel like they’re actually there in the danger zone. But how does he do it? The creative and experienced photographer sets up his cameras in advance, using some expert techniques. In an article for TIME’s Light Box, Winters’ preparation process is detailed: “The work begins the day before launch, when he positions up to nine cameras as little as 700 ft. (213 m) away from the pad. Each camera is manually focused and set for the particular shot it is meant to capture, and the wheels of the lens are then taped into position so that they can’t be shaken out of focus when the engines are lit. Electronic triggers—of Winters’ own devising—that do react to the vibrations are attached to the cameras so that the shutter will start snapping the instant ignition occurs. These images and more will be available in Winters’ book titled Last Launch set to release on October 20, 2012.